A classic Japanese dish of teriyaki chicken can easily be made at home with a five-ingredient teriyaki sauce and about 30 minutes of your time. This recipe may be considered a copy-cat style recipe of your favorite Japanese restaurant teriyaki chicken. It will become a favorite weeknight addition to your dinner repertoire that both children and adults will love! Poke chicken using a fork to help absorb the flavors of the teriyaki sauce during cooking. Make the teriyaki sauce. In a large bowl, combine sake, soy sauce, mirin, sugar, and ginger and mix well. 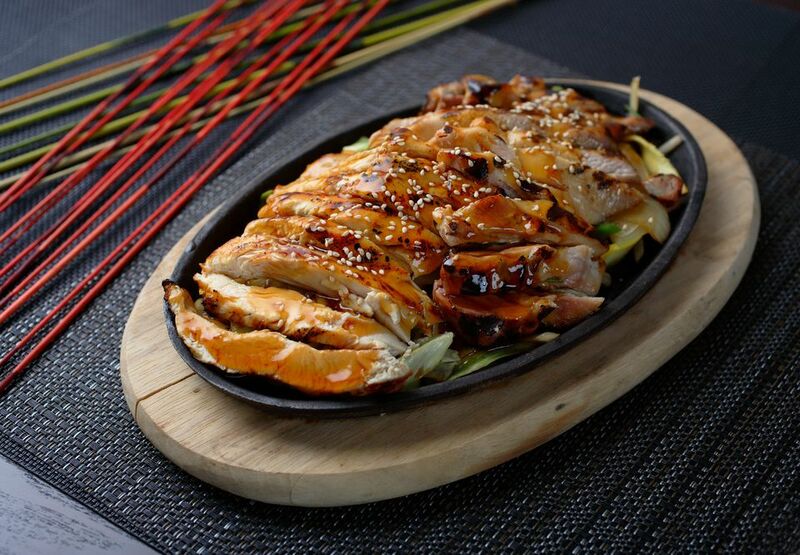 Add chicken to the bowl and marinate the chicken in the teriyaki sauce for 15 minutes in the refrigerator. In a large skillet, heat olive oil over medium-high heat. Place the chicken skin side down into the skillet, cooking the skin of the chicken first, until the skin is browned. Flip the chicken over to cook the other side, but reduce the heat to low. Pour the teriyaki sauce that was used to marinate the chicken into the skillet. Cover the skillet with a lid and steam cook the chicken on low heat until done, and the internal temperature of the chicken reaches 165 F and juices run clear. Remove the lid and simmer until the sauce thickens slightly. There is no need to add potato starch or cornstarch to thicken the sauce. Remove the pan from the heat. Slice the chicken and serve on a plate. Pour the remaining thickened teriyaki sauce over the chicken. Optional: If you like, garnish the teriyaki chicken with additional grated ginger. Use boneless chicken thigh for tender and juicy meat as this cut tends to be slightly fattier, or substitute with leaner boneless chicken breasts or tenderloin cuts. For best cooking results use boneless chicken with the skin on, and after the chicken is cooked you have the option of removing the skin before eating. When skinless chicken is used, there's a chance that the chicken will dry out when it is cooking. As with any recipe, adjust the amount of sugar to tailor the sweetness of the teriyaki sauce to your taste. Freshly grated ginger may be substituted with easy to use pre-grated raw ginger in a tube, available at Japanese and Asian grocery stores. It's shelf stable until its opened and can be stored in the refrigerator. It's a great, no-mess shortcut for adding raw ginger to any recipe. Use a skillet or pan with a lid.